The most engaging of the 11am matches was the one featuring the Brit, Johanna Konta and the up-and-comer, Belinda Bencic. 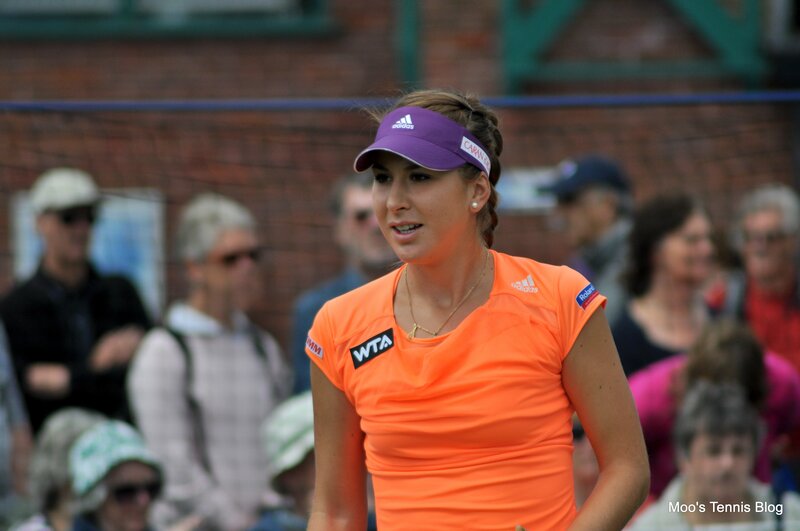 I am a big admirer of Bencic so I was pleased to get lots of photos for the blog! 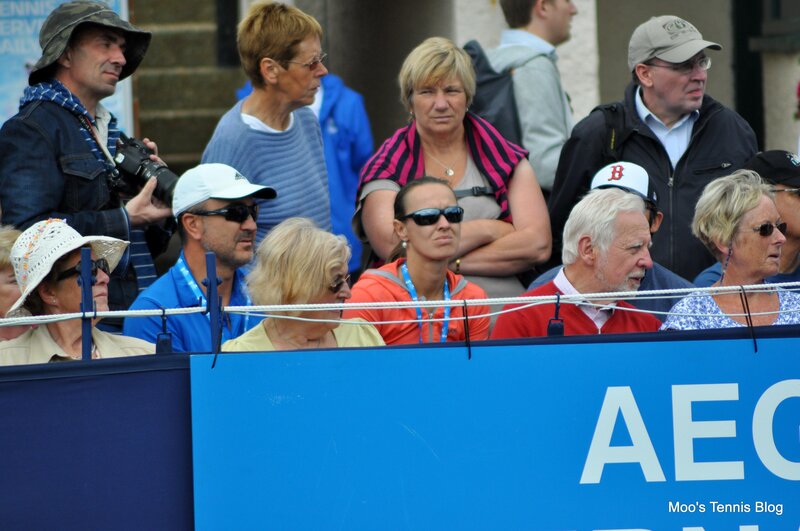 There was a solid crowd supporting the Brit, who lives in Eastbourne. Overall, she played a really great match that was centered around some excellent serving. Her serve preparation is pretty odd, but it’s success is really heightened on this surface. She was also very solid from the back of the court. Bencic only broke once, but just looked a little subdued and struggled playing against a crowd that essentially, was rooting against here. I spotted Martina Hingis watching this match in shades and both Mr Giorgi and Flavia Pennetta came along to watch some of this match. 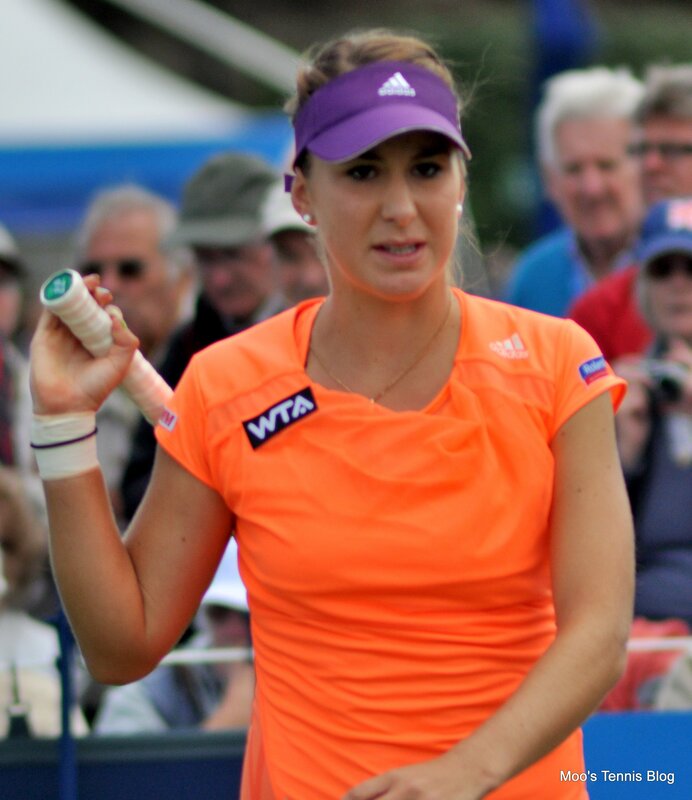 Naturally, Bencic was getting frustrated at the end. She was gesturing angrily and did slam a ball into the net in frustration. 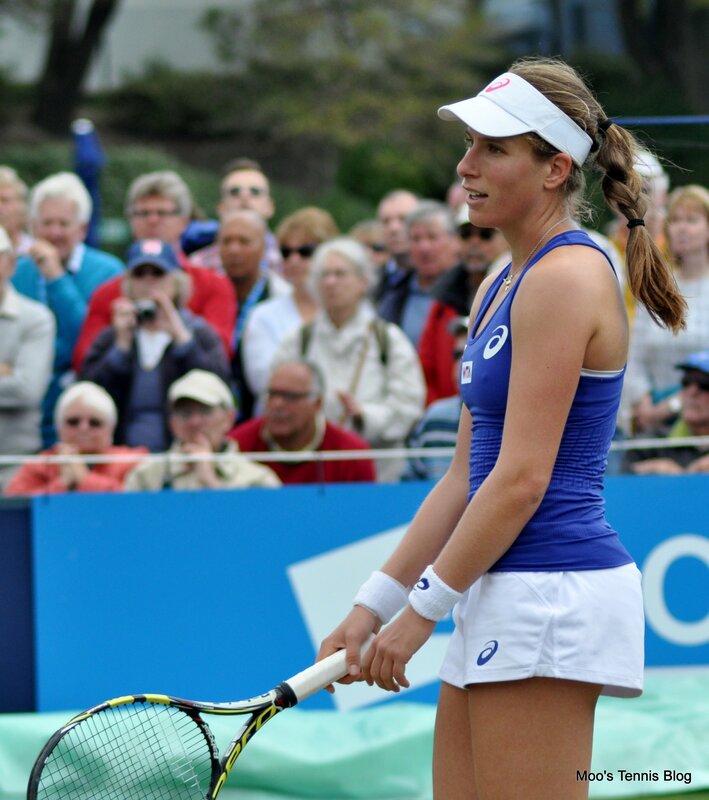 Konta needed eight match points before she finally secured a well deserved win. 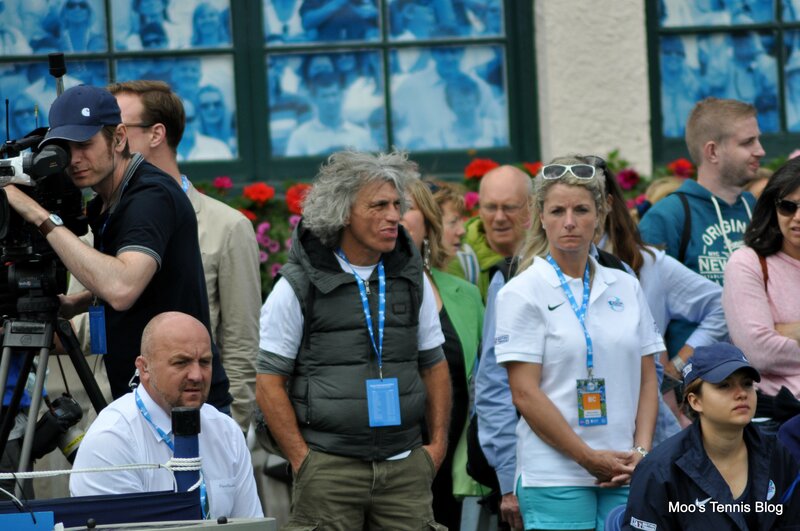 I was really chuffed at the quality of tennis I got to see at Eastbourne this year. Tuesday’s match of the day was a tremendous first round match between Giorgi and Azarenka. In terms of atmosphere, this match really captured the imagination of a normally, quite gentle Eastbourne crowd. Azarenka came from a break down to win the first set. Giorgi was too erratic and hadn’t quite found her range despite going up an early break. Both players strugged on serve, but it was Vika who was a little more solid off the ground. I noticed midway during the second set that Giorgi was stepping well inside the baseline to return the Azarenka second serve. It was a move that definitely paid off in breaking the Belarusian’s serve for the first time as Azarenka threw in a couple of double faults. Throughout the entire match, it wasn’t a technique that was 100% effective. In the second set, Giorgi served up a whopping nine double faults. On one occasion she flung her racquet into the ground in a rare show of emotion. Despite all the double faults, Giorgi raced into a 5-0 lead and this was purely down to some awesome hitting. Giorgi always goes for her shots and is frequently referred to as BBB (brainless ball basher). 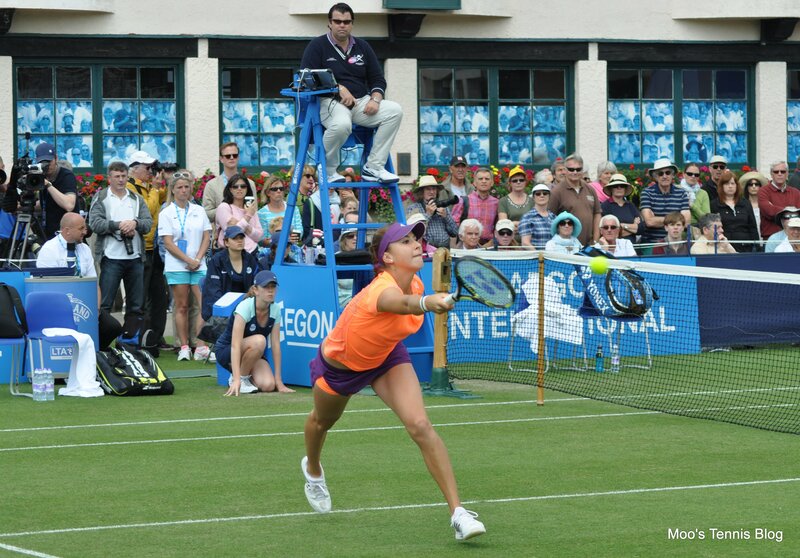 She was finding great angles on her backhand, which were exposing Vika in her backhand corner. Azarenka closed the deficit from 5-0 to 5-3, extending the set by a good 20 minutes. 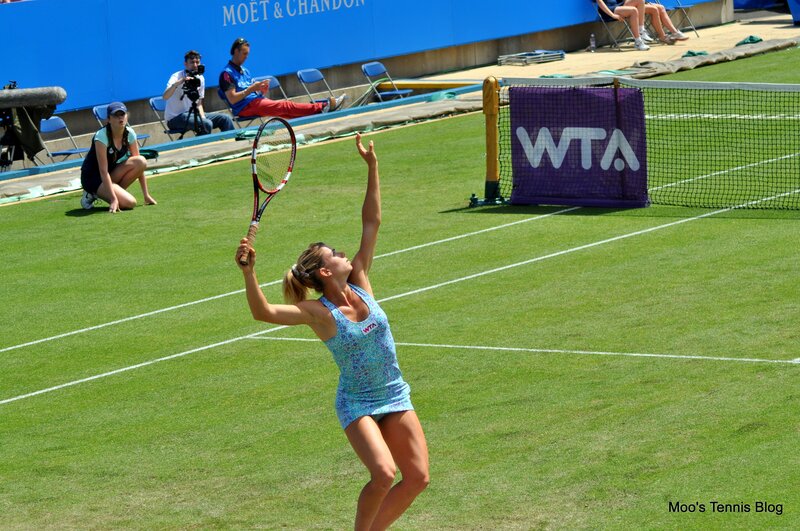 Eventually Giorgi forced the match into a deciding set. The first two sets were intriguing although the quality fluctuated. The third set however was absolutely fantastic and one of the most entertaining I have watched all year. Giorgi served for the match at *5-4, but was broken to love with a mixture of tightness and Vika bucking down. The pair then played out the game of the match at 5-5 as the match went back and forth with Giorgi earning break points and Azarenka having game points. 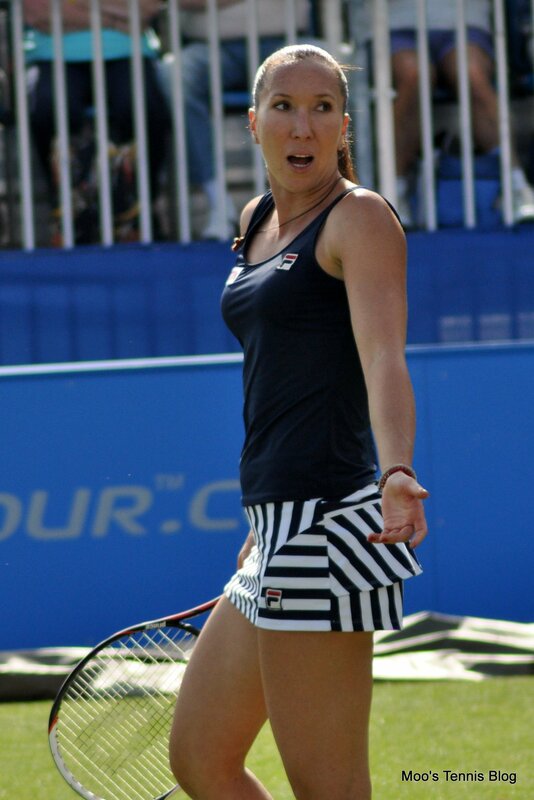 Eventually, Giorgi converted. 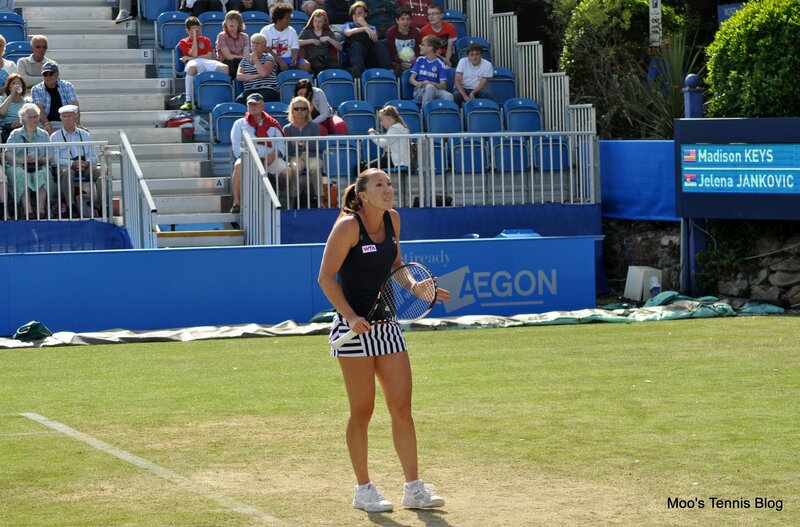 The crowd were really loving this match and the bulk of the support was for Giorgi… us Brits loves an underdog! At the second time of asking, Giorgi served it out. She approached the net with just a wry smile as she shook hands with Vika. I want to like Azarenka, but she always does things that nark me. All during the match she kept wanting to get a ball after an error and hit it back to Giorgi’s end of the court. On one occasion, she hit it straight back to Giorgi, who then hit it straight back to Vika, with an air of frustration smouldering in the shot. Vika apologised as the crowd laughed. In the final game of the match, Vika demanded “ball, BALL” from the ballkids after an errant shot. When she eventually got hold off a ball, she sent it back to Giorgi’s end of the court just as the Italian was preparing to serve. 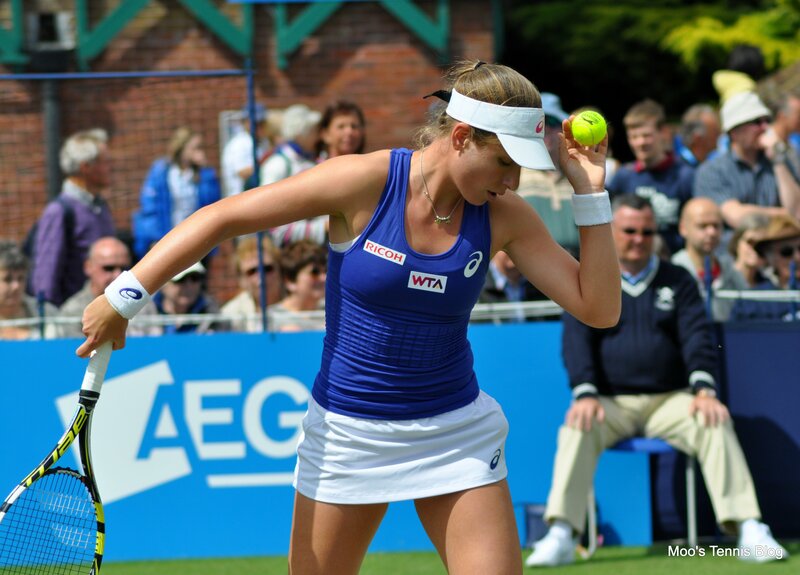 It was a disappointing display of gamesmanship, but thankfully, it didn’t deter Giorgi from gaining the win. The Italian has proven before that she isn’t afraid of the giant killing win and she played some stunning tennis at times. Unfortunately the umpire’s chair was blocking my view of everything that Papa Giorgi was doing! 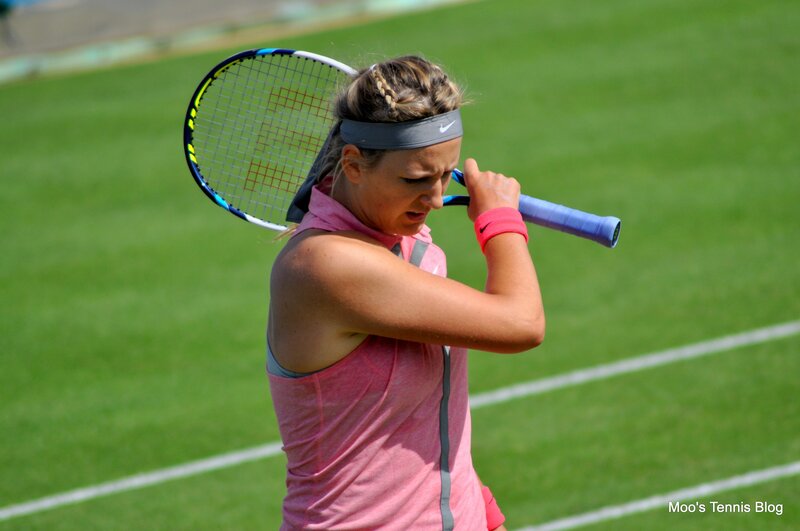 Azarenka actually played a really good match considering she had been injured and off the tour for three months. Like Aga, I thought this was a positive loss and she will have good opportunities to gain valuable ranking points at Wimby. It was another really tough decision to choose between Lucie v Petra, my two favourite WTA players and Jankovic v Keys. In the end, I made the controversial decision to watch Jankovic v Keys. For years and years and years and years, I have wanted to watch Jankovic live and she didn’t disappoint. Well, her tennis certainly did, but I was delighted to see peak dramatic JJ. The first couple of games saw a succession of breaks and were very scrappy. It was Keys though who settled into a beautiful rhythm, hitting big and finding the court. On occasions, she drew gasps from the crowd for the power she was able to generate. She also served extremely well throughout the match. Keys also wasn’t afraid to come into the net. After an early loss in Birmingham, I was wondering if she had what it takes on the grass, but I thought her movement was impressive in this match. Birmingham was obviously too early for her. 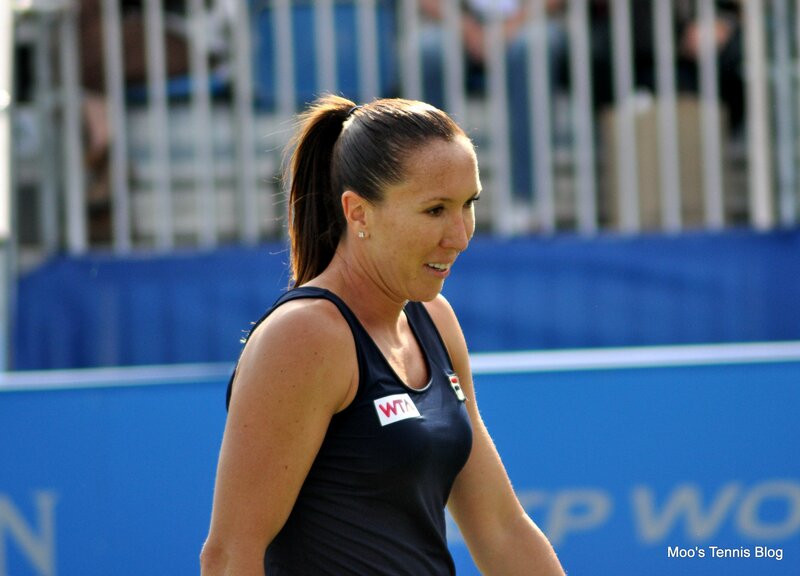 Jankovic essentially checked out midway through the second set. She hit too many errors off the forehand and there was an air of negativity surrounding her. There were some classic JJ antics; she looked back and yelled stuff in Serbian, which I assume was at her brother. He came on at the end of the first set. She was just talking and talking and talking… and blowing her nose. 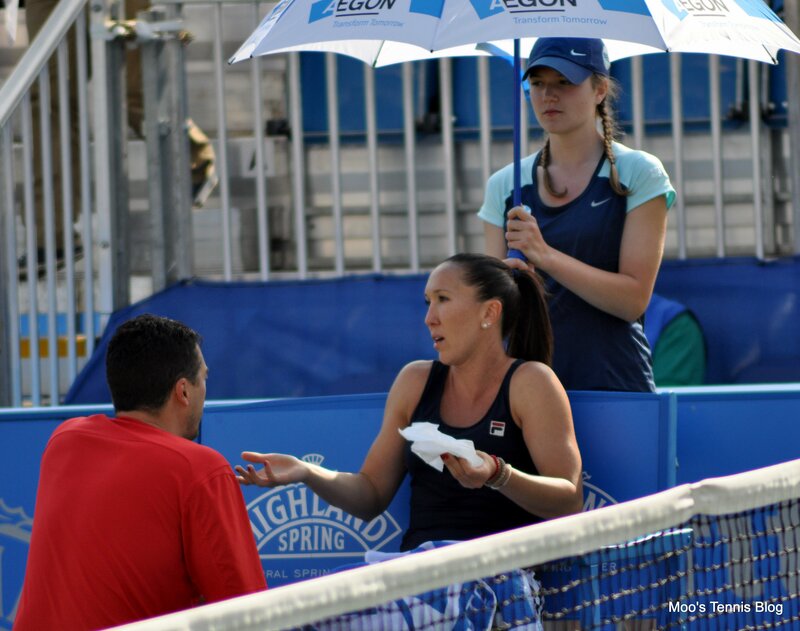 Is it me or does Jankovic have a permanent cold? 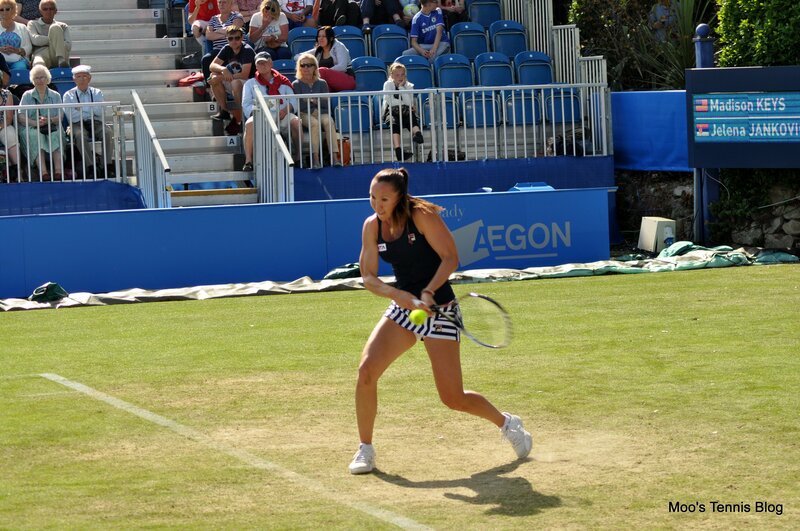 On one occasion, Jankovic screamed after a missed shot down the line, which drew some laughs from the crowd. She played better at the end of the match and even smiled after one fabulous point when both players came into the net. 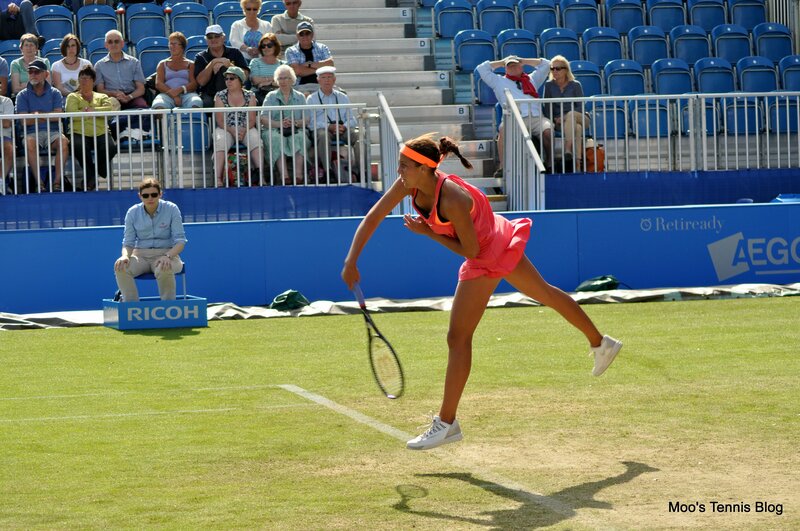 In the end, Keys was the deserving winner and has gone on to to have a tremendous week in Eastbourne. There were some hilarious comments behind me, which made me eye roll. According to the guys behind me, Jankovic “hasn’t won a Grand Slam for a while”. They seem to think she was world number one. Only like four years behind the time. It was amusing when they checked on their phone to realise she wasn’t number one! They also seemed to think she was Czech. I’m a bit of a snob when it comes to the tennis, particularly when I hear people making schoolboy errors in their lack of tennis knowledge. The JJ v Keys match wrapped up pretty quickly so I was able to join the Safarova v Kvitova match during the beginning of the third set. For two big hitters, it was actually of reasonable quality and there were pounding rallies towards the end of the set with some great winners. I can’t say I enjoyed it much because I wanted both players to win. Petra had match points in the second set, but needed to go around the M25 a couple of times before bringing up a couple more at *6-5 in the third set. Once again, she was unable to convert as Safarova benefitted from an extremely fortuitous net cord. Both hands from Lucie went up in the air. Lucie took the lead in the tiebreak, but blew her mini break with two really loose errors. It was another tight three set loss for Lucie as she went 0-5 against Kvitova. They shared a lovely hug at the net and Lucie was smiling way before the net. 3. 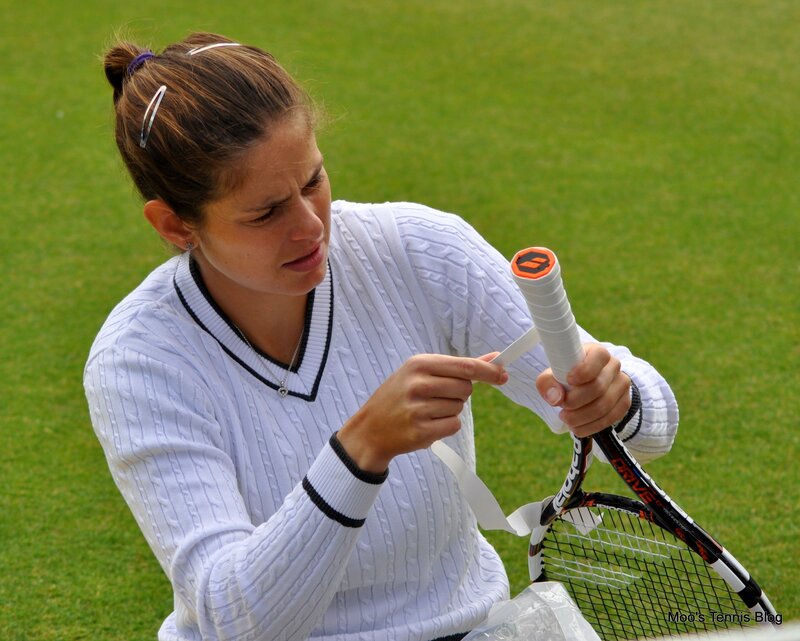 The first spot of the day was Julia Goerges who was lying down on the grass surrounded by Anna-Lena Groenefeld, her coach and a couple of physios. I wondered if something was up, but she looked pretty calm. 4. Caroline Garcia and Stefanie Voegele had both been knocked out at this stage, but were doing fitness on the practice courts. Voegele started off the day practising with Belinda Bencic. 5. Petra Kvitova and Angelique Kerber were practising together. 6. 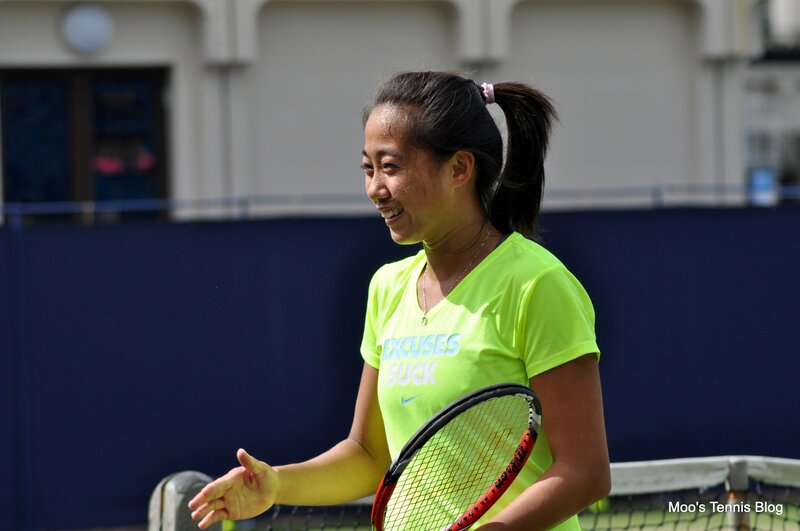 Zhang Shuai and Daniela Hantuchova were practising together. Zhang seems like a really sweet girl. 7. Sara Errani was practising with Tsvetana Pironkova. 8. Lauren Davis was practising with Flavia Penneta. 9. 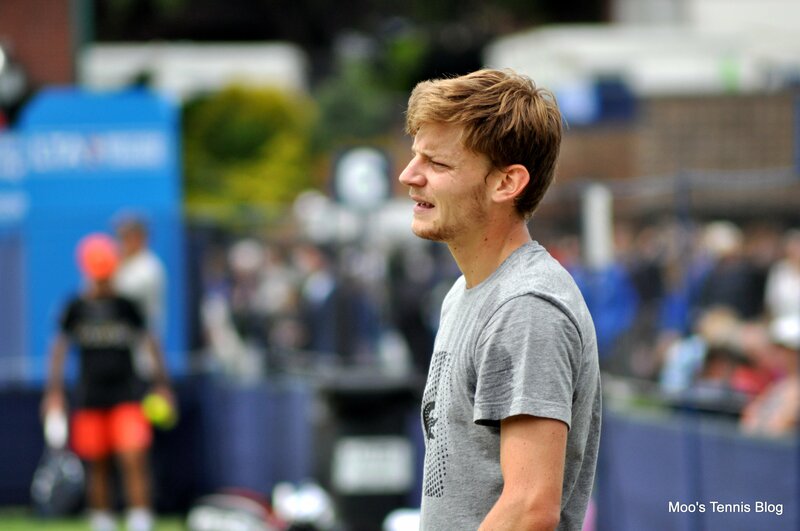 Gilles Simon and David Goffin were playing a really intense practice session. 10. Victoria Azarenka started warming up in the little area by the courts and drew a pretty sizeable crowd. She was practising with a hitting partner, who she told to “pick it up a little”. Sam Sumyk was there too. 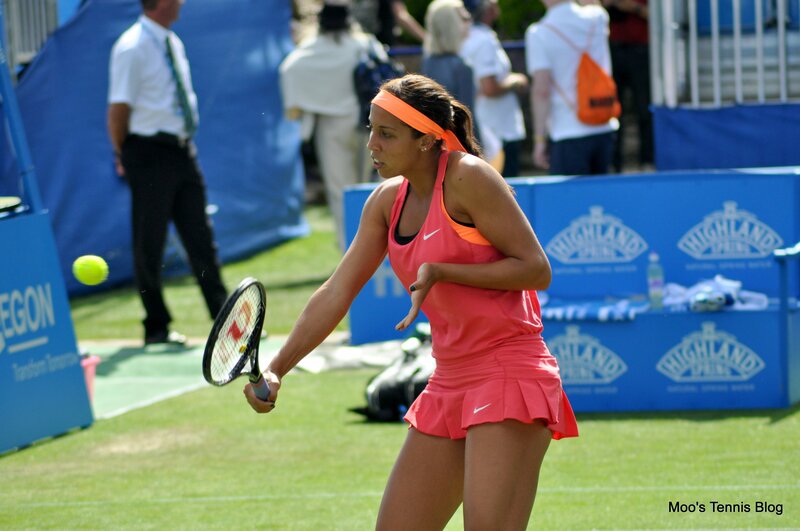 June 20, 2014 in Azarenka, Eastbourne, Giorgi, Jankovic, Keys, Tournament Report, WTA.